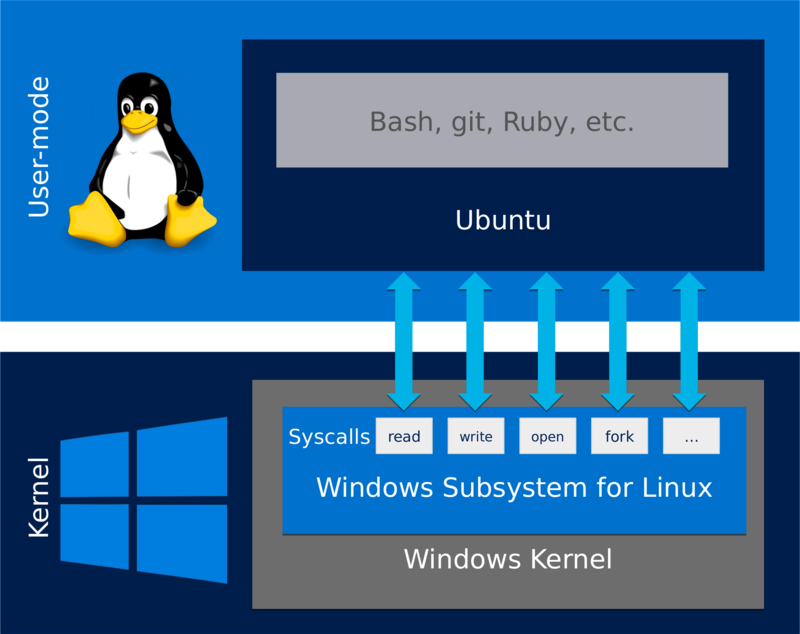 This week at Build 2016, the yearly developer-oriented conference, Microsoft announced that Windows 10 will be able to run Linux’s Bash shell, by executing the native Ubuntu binary as-is. Don’t stop at the news headline though: this is not just about Linux Bash, the command shell and scripting language. All Ubuntu user space commands can potentially work, including the apt package manager with which you can tap from the 60000+ software packages available in the Ubuntu repos. More technical details are found in two blog posts by Dustin Kirkland, an Ubuntu employee that worked with Microsoft on the magic behind. This is no virtualization / container technology. It is more about API emulation: Linux system calls get translated in real time into Win32 API calls. No need to recompile the binaries. It’s an approach that resembles the POSIX subsystem that was part of Windows NT, whose latest (2004) denomination was “Subsystem for UNIX-based Applications” (SUA), deprecated with Windows 8 and Windows Server 2012 and completely removed in Windows 8.1 and Windows Server 2012 R2. I guess it its just a resurrection of this approach. Even if this technology is aimed at developers, if you think about it, it has certain strategic implications. On the Operating System competition landscape, this levels the field with Apple OS X, which already had Bash and several package managers (but not apt ! and the binaries had to be recompiled !). It is a praise to the outstanding technical excellence of the Debian Linux distribution, which lies at the foundation of Ubuntu. It lowers the attractiveness of Linux on the Desktop, as developers can run all their preferred tools from within Windows. It lowers the barriers against migrating to Windows services and solutions developed on Linux technologies and stacks (MAMP, LAMP …): not that this wasn’t possible before, but you had to depend on many more bits and pieces of uncertain trust-wordiness. Now it looks like a simpler and well supported path. It obsoletes certain technologies designed for similar purposes such as Cygwin and MinGW. It also obsoletes the plethora of ad-hoc installers and Windows-specific binaries for tools such as ActivePerl, git, PostgreSQL, nginx, Ruby, Node.js et cetera. Finally, on the Open Source / commercial software divide, it demonstrates once more (should there be any need for it) that business can benefit from Open Source: effective immediately, thousands of Open Source enthusiasts are working for the good of Microsoft, with no compensation. ATM many questions are still open: when will this technology land on Windows Server (currently it requires to install an app from the Windows Store, which is not always possible) ? Will this be available on previous versions of Windows like Windows 7 and 8.1 ? Will this be integrated with system administration tasks such as installing / un-installing a service ? This entry was posted in Philosophy and tagged windows linux. Bookmark the permalink.